Custom Imprinted Dominoes Sets in Wood Boxes: Imprint the Wood Box and Dominoes! These Customized Dominoes Sets feature Double Six or Double Nine Dominoes (without spinners) in handy, Sliding Top Wood Domino Cases. 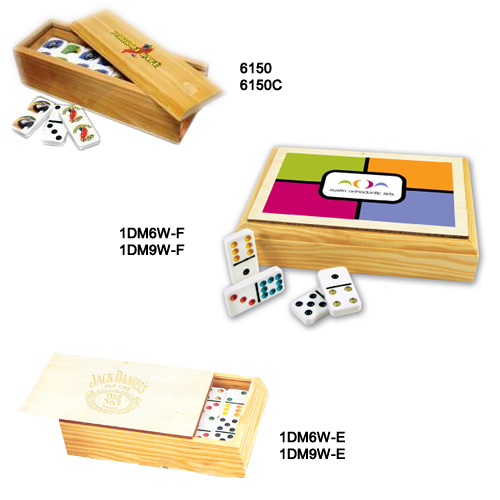 Each Customized Domino Set is available with an engraved or full-color Custom Printed Wood Box. Our 6150C Domino Set is also available with full color Custom Printed Tiles – each Domino Tile can showcase your logo/message! All of Custom Domino Sets feature standard size Domino Tiles, and all our Domino Tiles made of solid plastic. Our stylish Dominoes Sets in Custom Wooden Boxes are great as client gifts, as giveaways, for promotions, and much more! 1DM6W-E Double 6 Domino Set in Engraved Wood Case 10.75 10.70 10.65 10.60 10.50 4" 3"
1DM9W-E Double 9 Domino Set in Engraved Wood Case 12.75 12.70 12.65 12.60 12.50 4" 3"
1DM6W-F Double 6 Domino Set in Full Color Printed Wood Case 10.75 10.70 10.65 10.60 10.50 6-7/8" 3-9/16"
1DM9W-F Double 9 Domino Set in Full Color Printed Wood Case 12.75 12.70 12.65 12.60 12.50 6-7/8" 3-9/16"
• Domino: 1¾" x 7/8"
• Wood Box: 4" x 1½"
For additional information on our Customized Domino Sets in Wood Boxes, please contact us at 1-800-233-0828. You might also be interested in our Custom Domino Sets in Metal Cases and our Custom Domino Sets in Vinyl Cases.